Now is such an exciting time for Indian History! New technologies from satellite imaging to DNA sequencing are bringing scientific curiosity to the understanding of our ancient history. The latest findings are typically scattered in scientific journals and archaeological reports. In history books I find a sad disconnect between what they are still parroting and the latest findings. 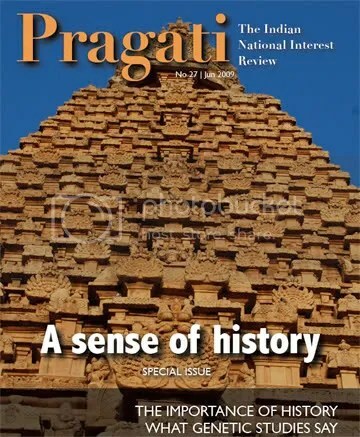 Thus it was such a joy to see the latest issue of Pragati, dedicated to early Indian History. Nitin Pai, an Editor of Pragati, who blogs at Acorn, has done a masterful job of collecting related topics in one issue. Nitin was magnanimous in writing here a short introduction to Pragati: A Sense of History. He has also given permission to have the complete issue of Pragati available here as a PDF. Previous issues are available for download at Pragati. Enjoy this issue of Pragati! Why is a magazine focused on strategic affairs, public policy and governance bringing out a special issue on Indian history? Because, as Philip Bobbitt argues in the Shield of Achilles, history, strategy and law are inextricably linked: they deeply influence and are influenced by each other. What this implies is that developing a shared understanding of history will help illuminate, clarify and perhaps even reconcile several contemporary debates over foreign policy, economic reforms and cultural values and social change. Colonialism and the socialism that followed independence meant that India’s grand historical narrative was controlled by a few gatekeepers—who exerted, and still continue to exert, an undue influence on what is taught, what is learnt and indeed what is accepted as legitimate Indian history. It didn’t help that when this was challenged in the 80s and the 90s, it was challenged by ideologues of a different stripe. Over the last few years, though, there has been a refreshing trend that uses the tools of science, and the scientific method, to investigate India’s past. Genetic studies, satellite-based geospatial imaging and computational techniques have been used to uncover some very interesting facts—and have already unsettled received wisdom. The future looks exciting. We hope this special issue of Pragati whets your appetite for more. thanks, arun, for this gift. i can’t wait to dig in! What a surprise, I was complaining to my friend last night that even respected Historians were ignoring the developments reported in Scientific journal, more so on the ancient history. It is so obvious that Historian being trained in India are still taught to got to Archives, museums and field trip, and they ignore satellite imagery, geological studies etc. In fact reading an article written by a famous historian from AMU, I was deeply pained how difficult it is to know the truth in the light of recent research and how colour-ed History in India is. ….Hailing from one such ‘red’ coloured universities myself, I always felt that I am getting to see just one side of the coin. I hope that main stream History will be updated in accordance with the recent scientific finding without any colour prejudice. it is heartening to see that many others too feel similarly about the state of Indian History! It may take a generational change to see improvements. But then, tis only history and eventually the truth does percolate up. And thanks to folks like Nitin Pai who are trying to shed a clarify light and at the same time bringing history to a larger cohort. Also, if you do come across interesting articles on Indian history, please do forward the links to me.